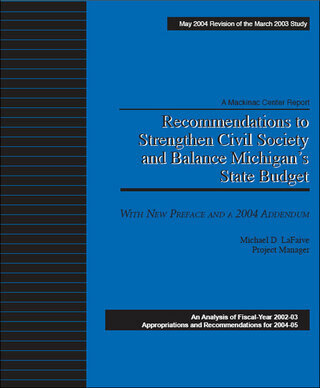 As the debate rages in Lansing over the size and scope of the 2004-2005 Fiscal Year state budget, the Mackinac Center for Public Policy is republishing and updating budget cutting ideas from its March 2003 study, "Recommendations to Strengthen Civil Society and Balance Michigan’s Budget." The 2003 study made over 200 recommendations that, if adopted, could still generate more than $2 billion in savings and one-time "revenue enhancements" for the state General Fund/General Purpose (GF/GP) portion of the state budget. The GF/GP is the area over which legislators have the most discretion. It’s especially notable that none of these recommendations include any cuts to revenue for the state School Aid Fund or the Michigan Education Assessment Program, we recommend only a small cut to Medicaid revenue. This report differs from the 2003 budget five ways. First, it excludes most budget line items that would have relied primarily on federal or special revenue funding. We made this change to simplify the report for our readers and to emphasize the savings that could easily balance Michigan’s budget without raising taxes — an imperative if Michigan is to compete effectively with other states and nations for economic growth and development. All of the data in the format above is taken from House Fiscal Agency (HFA) Line Item and Boilerplate Summaries released by the HFA in September 2003. We used this source because it contains more useful information than the proposed budget. By contrast to the HFA data published last year, we employed the Governor’s Fiscal Year 2005 proposed gross appropriation for each line item so legislators could tell whether or not the appropriation increased, decreased, or remained unchanged from the FY 2004 budget. The reader can find this information at the end of each "Recommended Action" item in study. Following is an example. The Fairs and Expositions section of the state budget should be eliminated. Savings: $17,295,900. Governor Granholm’s 2005 proposal decreases the gross appropriation to $16,801,300. Third, the author has taken the liberty of highlighting useful information by adding new italicized commentary within the 2003 text. Following is an example. To former Gov. Engler’s credit, he reduced the appropriation for this program by 38.5 percent over the previous fiscal year (ending in 2002), but Gov. Granholm could go further and remove the state entirely from this program. Migrants have been finding satisfactory places to live on their own accord since long before the state began inspecting and licensing migrant housing in 1978. Author’s Note: Granholm did go further than Engler, reducing the appropriation in FY ’04 by another 53.6 percent to $255,000. Prior to 1978, every housing situation may not have been ideal — from either the observers’ or migrants’ perspective — but that does not mean people were worse off then as opposed to now, on net balance. Fourth, the aggregate savings proposed by the Mackinac Center for Public Policy in this document reflect neither the proposed savings or proposed spending increases in Governor Granholm’s 2005 proposed budget. Fifth, the Mackinac Center for Public Policy recommends making other fundamental changes to Michigan’s budget landscape that did not appear in the 2003 budget study. Those are detailed in the 2004 addendum at the back of this volume.